As long as your heater is up and running, you may just assume that it is running properly and at peak performance levels. This is not necessarily the case, though. Only a well-maintained furnace is going to function as well as it possibly can. While routine maintenance must be handled by a trained professional, there is one thing that you can do to help protect the efficiency and performance quality of your furnace. Keep a fresh air filter in place. It’s a simple task that offers real benefits. What Problems Will a Dirty Air Filter Cause? A surprising amount of fairly serious issues can develop due to the presence of a dirty air filter in your furnace. First and foremost, there is the efficiency with which your furnace operates to consider. None of us want to overpay when heating our homes. That is precisely what you’re likely to be doing, though, if your air filter is dirty. A dirty air filter is going to increase airflow resistance, causing your system to work harder and to use more energy in its operation than it should have to. Your indoor air quality could suffer as a result of a dirty air filter, too. That filter is in place to protect your furnace, not really to maintain high indoor air quality throughout your home. However, if it it gets clogged up then pollutants may be forced around it as air seeks a path of less resistance. That can forced them out into your living space, negatively affecting your indoor air quality. If the filter is clogged enough, it can also cause your furnace to short cycle. The system can overheat, which will cause it to shut down prematurely. It will then have to start up too frequently, wasting energy while putting unnecessary strain on the system. 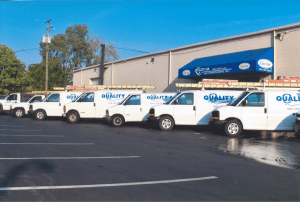 Contact Quality Air Heating and Air Conditioning to schedule professional heating services in Columbus, OH.